How to adjust a compensating drive sprocket: The chordal action of long-pitch sprockets usually subjects the conveyor chain and its driving parts to an additional load of speed-ups and slow-downs over and above load resistance. Posted January 11th, 2018 by Marvin Potter & filed under Conveyor Current Events and Trends, Conveyor Design & Concepts, Conveyor Maintenance & Set-up, Material Handling Solutions. How to adjust a compensating drive sprocket: The chordal action of long-pitch sprockets usually subjects the conveyor chain and its driving parts to an additional load of speed-ups and slow-downs over and above load resistance. Although this chordal action cannot be eliminated, its effect can be cancelled through the use of a compensating sprocket mounted on the conveyor head shaft. When the chordal action of the conveyor sprocket drives the conveyor at its fastest rate, the compensating sprocket will drive the headshaft at a slower rate. When the chordal action drives the conveyor at its slowest rate, the compensating sprocket will drive the headshaft at a faster rate. The difference between the speeds is significant considering the mass of the conveyor parts plus the mass of the material being conveyed. 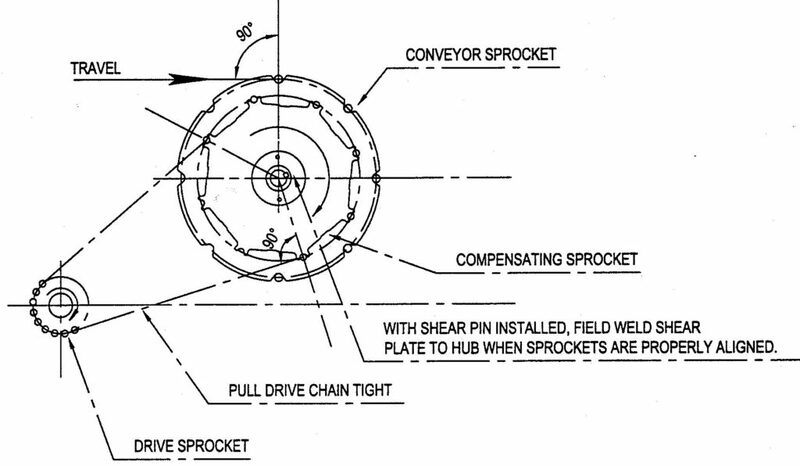 This drawing shows how to set a compensating drive sprocket.